State air-quality regulators are considering expanding the wood- and stove-burning bans to include businesses and industrial facilities. Burning wood in fireplaces and stoves has been forbidden for years whenever air quality gets bad in parts of northern Utah. Now the Division of Air Quality is considering similar regulations for businesses. The idea first came up when regulators were brainstorming in a public workshop last winter: Why not make commercial and industrial facilities comply with the same no-burn standards that homeowners do? Air quality regulators held another workshop on Monday to share their rough draft of how that could be done. Karmazyn says the proposed regulation is based on the idea that fireplaces in restaurants, stoves in wood shops and other non-food businesses might be contributing significantly to winter pollution. Preliminary research suggests that smoke can be blamed for more than 5 percent of the problem during high-pollution episodes. But, before the Utah Air Quality Board decides whether added restrictions are in order, there’s still more work that needs to be done. “There’s not really a baseline,” says, Megan Neiderhiser a manager of air sciences for Environ International Corp.
Jim Nielsen is a Republican representative from Bountiful who sponsored a wood-burning bill in the last legislative session. Nielson wants regulators to make sure affected businesses, lawmakers and the public are well informed about any new burning restrictions. 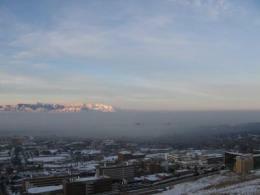 Utah’s smog season is underway. Some call it Utah’s overlooked pollution problem. Michelle Hofmann, a pediatrician and founder of the health advocacy group Breathe Utah, is used to hearing people complain about sooty pollution in the winter. But she says it’s harder for patients to grasp the impacts of ground-level ozone pollution, since it’s odorless and colorless. Researchers, regulators and clean-air advocates gathered Monday to talk about Utah’s air pollution woes. Jonathan Samet, chairman of Preventative Medicine at the University of Southern California’s Keck School of Medicine, focused his keynote speech on what else decision-makers need to know to build on America’s progress in tackling pollution. The American Lung Association released its annual report this week on the State of the Air across the country. The results for Utah are mixed.